This point might sound really obvious but given the recent popularity of e-cigarettes and vapors that do not give off actual smoke, there have been a couple of instances recently where there has been some form of “smoke,” within the monorail cabin. Per Disney’s rules, smoking is only allowed in designated areas located outside of the Disney parks. Even though these types of cigarettes might not be giving off actual smoke, they fall under the same category as ordinary cigarettes with regards to Disney’s rules about smoking. If you’re reading this website, you probably have the safety message about the doors memorized in both English and Spanish. While the message is a fun and catchy saying that has become a favorite part of the monorail for many guests, it’s very important to listen to what the message is actually saying. You don’t want to be leaning against the doors when they open, because that could cause you to trip and hurt yourself. I can kind of understand what might cause this to happen on the monorail. Perhaps if you’re on the Epcot line, and you have the whole monorail ride ahead of you it might seem like a good idea. 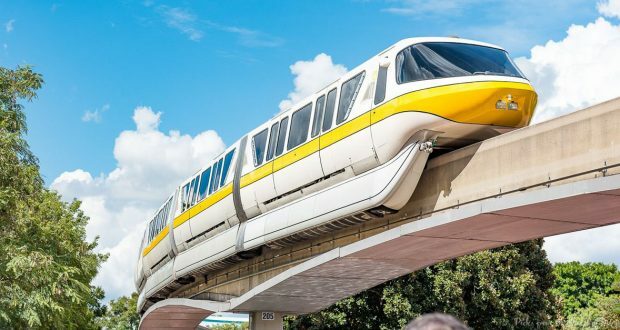 I still wouldn’t do it though, the time spent on the monorail really isn’t all that long, and there are restrooms at the front of each park as well as very close to the monorail stations at the resorts. If you realize you need to change a diaper while on the monorail, just wait until the next stop and head to the nearest restroom. The monorail comes frequently enough that you won’t waste a lot of time by doing so. There is nothing wrong with showing some affection for the person you love, and Disney can be the perfect place to do so. That being said, there are some forms of PDA that take it just a bit too far, and should really not be happening on the monorail. A kiss here or there is totally fine, but once you start getting hands-y, or it’s becoming clear that your kissing might be making others uncomfortable, it’s time to tone it down. Blocking doors is most simply a safety concern, and on a crowded monorail this can also be a huge inconvenience to other guests who are behind you and are trying to exit. While it can be difficult not to block the doors if the monorail is crowded, you can always step to the side when you come to a stop or exit and wait right outside the door for guests to leave and then reboard. I’m not a huge fan of people using foul language anywhere at Walt Disney World, but the monorail can be one of the worst locations for this to happen. Monorail cabins are fairly enclosed spaces, and there is not really much else going on to distract from other guests’ conversations, for this reason, I think it’s important not to use vulgar language on the monorail. Other guests, especially those with small children will be appreciative when vulgar language is not used in the monorail cabin. One of my biggest pet peeves is when guests take up way more space on the bench on the monorail than they actually really need. We’ve all seen this happen before, and maybe we’ve even been guilty ourselves. I’m talking about when people spread out, maybe have their legs out on the bench, or leave spaces for children who aren’t sitting still anyways, or could be placed on an adult’s lap, or even worse, when they give their bag a seat. If others are on the monorail car and they are standing, your bag does not need a seat. The monorail benches can actually accommodate a good amount of guests, so it’s nice to have as many guests use them as possible. Everyone is tired after a long day in the parks and would like a seat, so just make sure you think of this option before giving your purse or lap child a seat over another standing guest. The worst thing you can do on the monorail is leave your trash behind. Disney is very lenient in that you can easily bring food and drinks with you on the monorail, however there are no trash cans in each cabin. This means that you’ll have to hold on to your trash until you get off, which really is not all that difficult. The monorails are often not cleaned by custodial cast members during operating hours (unless there’s a specific reason why they need to be) because it is too much of a process to have cast members cleaning while guests are going to and from the parks. Instead the cabins are cleaned after the park is closed. So if you leave trash inside the monorail, it will most likely be there all day, for other guests to see. Brittany DiCologero Bio Brittany is a graduate of St. Anselm College, where she earned her bachelor of arts degree in History. She completed two Disney College Programs, one at Dinoland U.S.A., in Animal Kingdom, and one at Lights, Motors, Action! Extreme Stunt Show at Hollywood Studios. She is the author of “Brittany Earns Her Ears,” a memoir about her experiences on the college program, and she currently resides in Massachusetts.